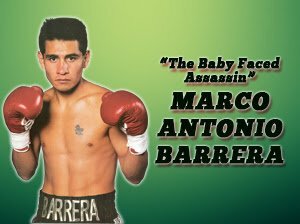 The International Boxing Hall of Fame announced today three-division world champion and 2017 Hall of Fame Inductee Marco Antonio Barrera will be in Canastota to participate in the Hall of Fame’s 30th Anniversary celebration during the 2019 Hall of Fame Weekend, June 6-9th. “I’m so excited to celebrate this special moment with a lot of boxing favorites and greatest. This is important because it preserves boxing history at its finest,” said Barrera. A five-time Mexican national champion, Barrera turned pro in 1989 at age 15 and won his first 43 bouts. As a pro, he won titles in three weight divisions (WBO super bantam, WBC feather and WBC / IBF super feather). Barrera boxed a legendary trilogy with Erik Morales (L 12, W 12, W 12) and scored wins over Kennedy McKinney (TKO 12), Jesse Benavides (KO 3), Naseem Hamed (W 12), Johnny Tapia (W 12), Kevin Kelley (TKO 4) and Paulie Ayala (TKO 10). The versatile boxer / puncher retired in 2011 with a record of 67-7 (44 KOs). Barrera is now an analyst for TV Azteca. In 2017, Barrera was elected into the Hall of Fame in his first year of eligibility. An impressive list of over 35 boxing greats from the United States and abroad, including five-time world champion Vinny Paz, junior welterweight star “Irish” Micky Ward, 1970s heavyweight star Earnie Shavers, two-division champion Ricky “The Hitman” Hatton, referee Kenny Bayless and Hall of Famers Carlos Ortiz and Michael Carbajal, are scheduled to participate in the 30th Anniversary celebration. For more information on the Hall of Fame’s 30th Annual Induction Weekend, please call the Hall of Fame at (315) 697-7095, visit online at www.ibhof.com, on Facebook, Twitter and Instagram .